Heidi over at Foxgloves, Fabric and Folly is hosting an Autumn Recipe & Tablescape Exchange. She shared her own beautiful tablescape and a recipe for a Pumpkin Banana Tart that sounds delicious. There is a list of everyone participating. Head on over and take a look through all the tablescapes and Autumn recipes. Decide to share your own? Let me know in the comments and I'll come take a look. 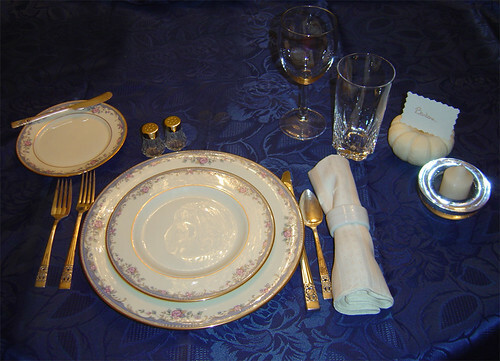 My china is Southern Vista by Lenox, it's cream with blue, pink and gold floral accents. It doesn't lend itself well to autumn placesettings. Remember how I professed my love for white mini-pumpkins, they work well with the many blues in my home. For dinner... I just love the mini salt and pepper shakers my mother found for me. 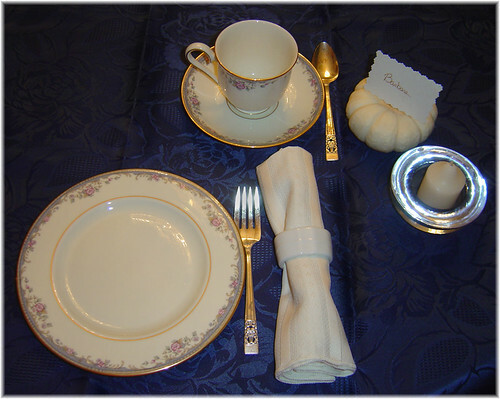 They go so well with my china and I have enough for each place setting. It wouldn't feel quite like autumn without warm drinks, typical choices are cocoa and cider, but two of my favorites are Glögg and Hot Buttered Rum. Glögg is a Swedish drink often associated with cold winter evenings around the holiday season. However, I think it's perfect as the air becomes cool and crisp. Glögg can be made non-alcoholic by using a grape or currant juice in place of the wine. Hot Buttered Rum is delicious as per the directions, however I've also used the butter mixture over hot apple cider for a non-alcoholic version that is delicious. Remove spice satchel from the water. Add 1/2 cup sugar to the water and bring to a boil. Add the bottle of wine, heat until steaming. Do not bring to a boil. Traditionally, this is served with bits of blanched almonds and raisins in each glass. In a large bowl cream the butter and the sugars together until smooth. Add the softened ice cream and mix until creamy. Transfer this to a freezer container with a tight fitting lid. This mixture can be stored in the freezer for up to 1 month. Place a heaping 2 tablespoons of the frozen mix in a glass or coffee mug. Add 1 to 2 tablespoons dark rum (Captain Morgan's!). Pour over the mix 6 ounces of boiling water and stir until the mixture is melted. Sprinkle top with cinnamon or nutmeg and serve forth!